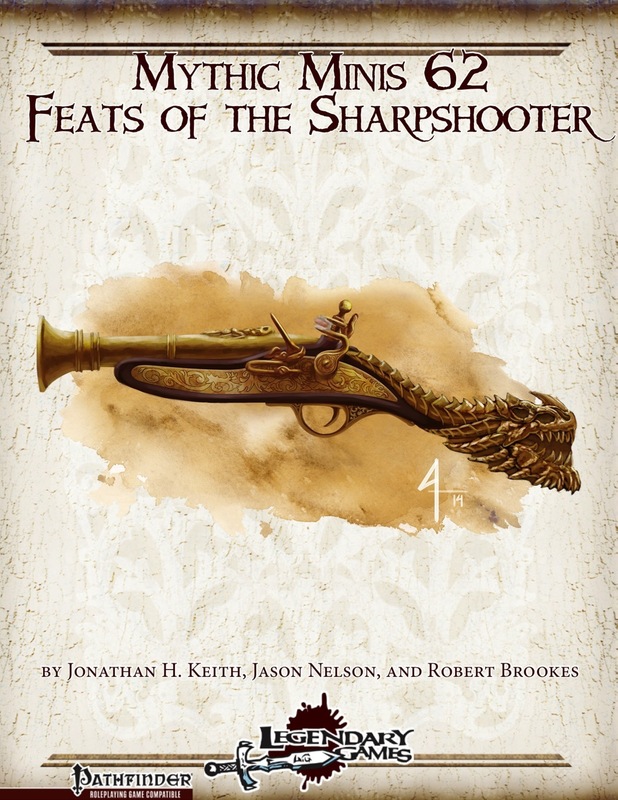 Feats of the Sharpshooter brings you 12 mythic feats for your sharp-eyed ranged combatants to get their enemies in their sights and put them on the ground, or switch hit when the battle comes to them. 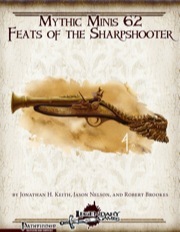 Unleash death from afar with feats from Opening Volley to Charging Hurler and Arc Slinger to Casterbane Shot! -Clustered Shots: When shooting at the same target as a full-round action (or via another ability that allows you to execute multiple shots versus the target), add damage equal to the number attacks that hit the target. Additionally, you treat all as one type of attack for the purpose of overcoming DR or death from massive damage (if you're playing with the latter in mythic, you're more masochistic than I am...). Also gain +2 to atk versus an opponent you've hit in a given round. Urgh. The bonus itself is not that bad - the DR-overcoming is nasty, though. Why? Shuriken. OUCH. -Prone Shooter: While under the benefits of the feat, 1/round negate an attack by moving 5 feet. Per se cool - but is this a 5-foot-"crawl"? Does the movement provoke AoOs? I think it doesn't but if it does and an enemy keeps you fixed, does the attack you sought to avoid still hit? No idea. Needs clarification. -Redirected Shot: Use the feat after the results of your ally's attack have been made known. Additionally, if cover from you and your ally to the target differs, use the lower of the two. Nice one! Now available - don't miss it!